A 13 amp plug will usually come with a 13 amp fuse. This is the maximum amount of current an appliance can draw before the fuse blows. Some appliances however will come with identical plugs which have a lower rated fuse. 3 amps or 5 amps for instance. It is VERY IMPORTANT that you replace like with like. Do not use a 13 amp fuse in a appliance that stipulates a 5 amp fuse, for instance. 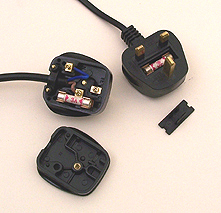 Above, two types of plugs showing the fuses. A fused spur to an individual appliance may form part of you household wiring. (they may also have a switch)These wall mounted fittings have a fuse inside which may need replacing. Switch the power off first. 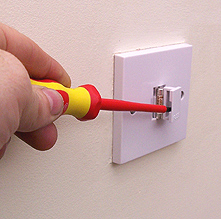 Use a fine flat screwdriver in to pull it out the fuse holder to reveal the fuse. Replace the fuse with the same rated fuse. Tip Test fuses with a continuity tester.